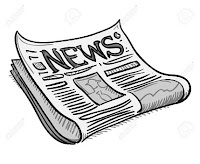 Writers who got their start as journalists, working for newspapers and magazines, are a little different from those who started right off writing books. I know. I'm one of them. My first paid writing gig was a column that I wrote for a suburban newspaper. It's Not All Gravy was a humorous column patterned after the great Erma Bombeck - who was my inspiration when it came to parenting - and it ran for several years. Keep in mind that I wrote this column while raising five kids, the youngest a set of twins age three. So I don't want to hear any of you moms with one baby whining out there. Okay, you can whine, but you also have to write. Every day, if you truly are a writer. While the twins napped, I wrote my column on spiral notebooks - I still have a few of them - then in the evening I typed them up on my trusty Smith Corona, which had replaced my 1942 Royal manual. The next day, I loaded all the kids into the van and delivered the column to the newspaper. No. I am not older than dirt, but almost. But this was before home computers and way before the convenience of emailing files back and forth. 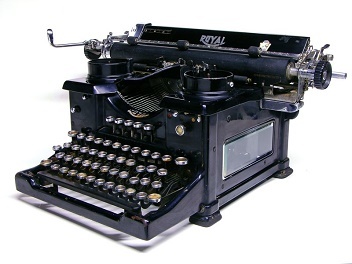 I didn't keep my Smith Corona, but I have kept the Royal typewriter. It sits in a place of honor in my office. That first gig led to writing feature stories and reviews for The Plano Star Courier, and I also wrote a few articles for The Dallas Times Herald. Soon after, I started writing another regular human interest column for The Texas Catholic newspaper in Dallas, which opened up another avenue for writing articles and profile pieces. When I started writing articles and short stories for more regional and national magazines, my husband decided that it was time I had a computer. 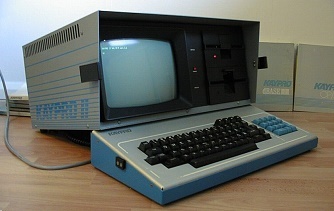 He worked in the computer field, so he knew about home computers, and he had read about one called a Kaypro. There was even a dealer in the area, so we went over and bought one. My kids were most distressed when I told them they could not play games on it. The computer was just for my work, and I was worried that they would do something to mess it up and I would be stuck using the typewriter again. Which was kind of funny since I messed it up plenty of times, and my kids are part of that first wave of a tech-savvy generation. They still help me when I mess up. This is what my computer looked like. The best part of having the home computer was this humongous printer that connected to it, so I typed on the computer, made changes and fixed typos and sent the document to the printer. Not having to try to fix typos with White Out or the other tools we had back in the dark ages, was a godsend. The printing process was fairly quick and easy when it came to a one or two page column, or an article of a few pages, but printing an entire book manuscript was a day-long affair. The printer was very, very slow. Still, it beat typing 400 pages. So what does this all have to do with deadlines? Plenty. I had lots of them over those years of raising kids and trying to keep some semblance of order in the house. I learned to write quickly, in small increments of time, which does work well for nonfiction. I think it is harder to do that with fiction and stay immersed in a story, but it can still be done. I managed to write a couple of books in that time period, and I currently write around some health issues that have pushed me to find creative ways to keep working. During those years of freelancing, I also learned the importance of being disciplined about the writing and how to forge ahead in the face of rejection. Back then, the rejection slips came in these self-addressed envelopes we had to include with submissions. I can remember walking to the mailbox with anticipation that the SASE would contain an acceptance, only to be disappointed more often than not. But, after time, I learned to shake the disappointment off and send that story out again. My first short story to appear in Lady's Circle magazine was accepted after the piece had been rejected twenty other times. Which leads me to the final lesson I learned as a freelance journalist - perseverance. To me, that is the most important part of any success story. So what is the most important part of your success story? What lessons have you learned through your years of writing? Do share. 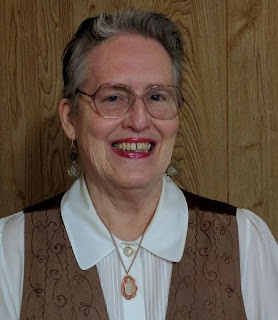 Maryann Miller - novelist, editor and sometimes actress. Her most recent mystery, Doubletake, was named the 2015 Best Mystery by the Texas Association of Authors. She has a number of other books published, including the critically-acclaimed Season Series that debuted with Open Season. Information about her books and her editing rates is available on her website. When not writing, Maryann likes to take her dog for a walk and work outside on her little ranch in East Texas. I got more writing done after having kids than pre-kids (and managed to publish a book). They make you appreciate and use any little bit of time that crops up. I've never really had to work to deadlines, except for the time I had less than 37 weeks to get the first draft of a book done before the birth of my second child. That motivation was really helpful, and I've felt the lack of it since. Unfortunately giving myself "fake" deadlines doesn't cut it. I know what you mean by the fake deadlines. They don't work as well for me either. And I also am more productive when I have more on my plate. I have to organize more, and that helps. I think I was more likely to write on any notebook paper I could find rather than a spiral notebook, but then it was to the used Royal typewriter to bang out my short stories, poems, and (eventually) novels. I don't know the year of my typewriter, but you can see George Reeves using one on the original Superman TV series. I didn't own a Kaypro, but I used one in the office. By day I was a computer programmer. GW-BASIC. I eventually replaced the Commodore 64 at my house with a used Osborne, after Osborne went out of business. In my early days, I learned that I didn't need an external deadline. My ideas possessed me and demanded to be written. I'd give up TV, I'd give up sleep, I'd give up AD&D to write them. Now that I have far more free time than I did back then, I use NaNoWriMo to give myself a deadline. My ways have changed. I guess I've learned that "I don't have time to write" is an excuse, but we all know that, so it's not much of a lesson. But even so, if you "can't" make time to write, you probably shouldn't. Just read something instead. Reading totally rocks. Yes, reading does totally rock. Most writers are avid readers, which is why we have sagging bookshelves and over-loaded reading devices. My husband programmed with Basic, too. Also used cobalt. He may have been in the business about the same time you were. I love the fact that your stories pour out. That is terrific, and I hope they continue to do so. Love that picture of your old computer! Before my first book was published, I also wrote for a local newspaper, but only as a stringer. That was my first way of getting published, and I was excited when my first article was accepted! It taught me to be very careful about getting things down correctly. I couldn't afford to make mistakes, because someone would surely catch them! I have always tried to catch mistakes, but, alas, I am not as good about that as I should be. I type too fast and sometimes post a FB message only to see a glaring typo. Glad we can edit those. I started writing late in life, so I never wrote on a typewriter. BUT, sending out queries and getting rejections is quite clear in my mind. My early work was illustration, and those did have deadlines, and I had two kids at home when I did that work. My biggest client was about 25 miles away, and I sometimes took my sons when I had to deliver the work, which I did free-lance at home. The ad agency was very nice about it and gave the boys a free room with paper and markers while I discussed the storyboards with the art directors. Those were the days. When I collaborated in writing Doubletake, that was before computers, too. I would often have to take my kids to Margaret's office, and she was always nice about having them there. Sure makes a working relationship easier when that happens. What a fun jaunt down Memory Lane. Jaunt? No. Hobble. Yes. Not a great week here. Have flu. Passed out (first time ever). Fell. Broke ankle. A fun trip to the ER in an ambulance. These little health issues definitely create massive sink holes out of irritating chuck holes. Enough whining. I never took a typing class, hated typewriters, but finally did buy one. Then, at the insistence of No. 2 son, I bought my first computer -- from Radio Shack. Interesting operating system: TRS-DOS, which my boys lovingly christened TRASH-DOS. From there I traveled down the road to MS-DOS, and finally to Windows. My first Windows computer had a 25 meg hard drive, and I thought I was in cyber space heaven. Lots of years ago. Lots of things learned. Fast forward to today. As noted, fake deadlines don't work, especially when the writer also owns the publishing company. Huge hard drives and massive programs do not make books write themselves. The love-hate relationship with computers (and typewriters) evolves into a strained truce that ends in a (one-sided) grudging respect because its the means to the desired end -- a published book. Sure do wish I could evolve as quickly as the tech industry does, but then life wouldn't be nearly as interesting. You have had quite an adventure with computers, and your recent ambulance trip. I've had a few too many of those, too. In the end, I think perseverance wins out. Hope your ankle heals quickly. Oh no, Linda! Ouch! Hope you heal quickly. I wrote my first manuscript on a portable typewriter. Those of us who did that have our own shared set of memories. Did you ever put the carbon paper in backwards and have the copy in reverse on the back of the first page? OMGosh, yes. Hated when I would notice after typing an entire page. I remember onion skin paper. It was such a pain! The younger generation can't appreciate our suffering. LOL. I feel like such a slacker now! ;) You're right, the discipline of deadlines is a must. Thank you for sharing! Sometimes I feel like I had more discipline when I had four children to take care of then I do now when they're all grown up. It did teach me to write at night, long after the rest are in bed. I stayed up late, too, and sometimes would get up in the middle of the night when an idea hit. Then I hated myself in the morning when the kids were up bright and early for breakfast.